Las Vegas, NV – The 2013 GEICO AMA EnduroCross Championship, fueled by Monster Energy came down the final race and Taddy Blazusiak and Mike Brown engaged in an epic battle for several laps before Brown went down and ultimately finished ninth. Blazusiak finished fifth to secure his fifth consecutive championship. “That was probably the worst race in my life but it was all about me and Brownie” Blazusiak said. “We got together in the first turn and then again in the second turn and it went from race mode to crazy mode. We must have hit fifteen times but we got it done to win the fifth title” he continued. Click here for the BEFORE interviews. Beta’s Cody Webb won the Vegas finale to take his third win of the season, more than any other rider. Webb missed one race due to a broken foot but still finished third in the championship. “I am ecstatic right now. I had a great season except for that little setback” Webb said. “The track tonight was insane but I loved it”. Webb crossed the finish line in eleventh on the first lap but quickly moved to fourth due to a huge pile up on the second lap that included Brown, Blazusiak and David Knight. Webb took his time passing Cory Graffunder, Kyle Redmond and Geoff Aaron and took the lead on lap six of twelve. He slowly opened up a comfortable lead and ultimately won by five seconds. The battle at the front was tight after Blazusiak went down on lap two and handed the lead to Aaron, who held the point for five laps despite heavy pressure from Redmond. Aaron got held up by a lapped rider and then struggled to get going and ultimately finished sixth. Husqvarna’s Graffunder rode a solid race to work past Redmond on lap nine and finished second. “I got an OK start and I have had several third places so I am really happy to finally get a second”. Graffunder said. Redmond battled with Aaron for several laps and then scrapped with Graffunder until a mistake dropped him a few seconds back but he finished the season strong with his first podium. Rockstar/Lucas Oil JCR Honda backed Colton Haaker worked his way up to fourth after falling as far back as eleventh. He added some intensity to the championship battle when he caught Blazusiak and Brown and ultimately passed both of them cleanly. Haaker was closing on the lead group but ran out of time to move up any further. Monster Kawasaki’s Taylor Robert finished seventh followed by Gary Sutherlin, Brown and Destry Abbott who rounded out the top ten. Blazusiak finished the season with 146 points to take the title. Brown was four points back with 142 and Webb was another seven back with 135. Bryan Roper, a top American Trials rider won the MAVtv Junior EnduroCross Championship, which is a championship within a championship for riders that are 21 and under. He finished in a tie for 13th in the final points. Rachel Gutish got her first ever GEICO EnduroCross win in the Women’s class. She outlasted Kristie McKinnon, who traveled all the way from Australia to compete in her first ever EnduroCross and finished second. RPM KTM’s Chantelle Bykerk finished third and had already clinched the 2013 Women’s Championship at the previous race. Twenty two year old Harrison Oswald won the Open Amateur class to earn the AMA number one plate. He was joined on the podium by seventeen year old Noah Kepple and fourteen year old Ty Cullins. So the young riders are quickly coming up through the ranks. Kurt Nicoll won his third consecutive Vet 35+ championship. At the age of 49, he was one of the oldest rides in the class but is showing no signs of slowing down. Josh Adams rode a great race to finish second. Dirt Rider Associate Editor Adam Booth was in contention for the win on the last lap before a crash took him down but he recovered to finish third. Jack Field won the AMA TrialsCross Championship. The Australian topped Ty Cullins and Phil Smage. You can find the complete results at this link. 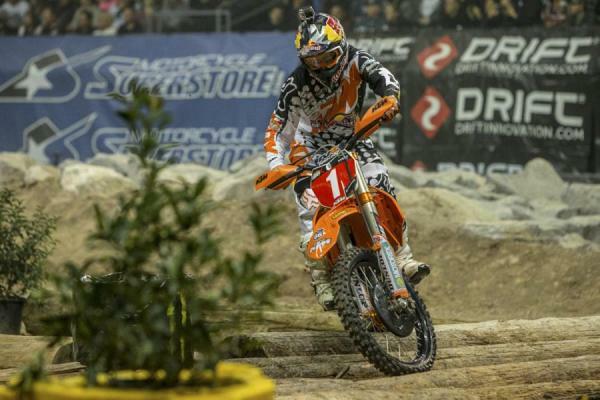 KTM’s Taddy Blazusiak came out of top of a crazy battle for the GEICO Endurocross Championship on Saturday night at the Orleans Arena in Las Vegas. Tied in points with fellow KTM rider Mike Brown going into it, the two rivals ended up falling on top of each other several times during a heart-stopping, drama-filled main event. Blazusiak edged Brown with a fifth-place finish in the main, taking his fifth-straight (!) EnduroCross title. But it wasn’t easy! Racer X: We knew there would be some pressure, and it seemed like earlier in the day you were doing a good job ignoring that, but did it get pretty gnarly when the race started? Taddy Blazusiak: No, I kept my cool. Going to the gate, everything was going great. Me and Brown, at the hot lap you could that we were on fire [they finished first and second in lap times]. Then I got the best start you could possibly ask for, super good jump. Then I cut the guys off in the first corner but I went a little bit too wide. I lost it a little bit so I knew that Brown was going to be coming to the inside. So I tried to get back inside. We got together. We got together again going to the first log! We got together again going to the second corner, and this is when we went from racing mode to crazy mode. This is when it went all wrong… well, I don’t want to say wrong, just from this point on it was all about me and Brownie. And it really happened in the fire wood corner. I was trying to play it safe and roll it into the fire wood corner, which was a big mistake. I should have been going as hard as I can, because that’s how we get around the track the best. I was trying to play it safe and this is never working. So I went down. I thought I was done. I picked myself up and Brownie was there! That was the place where we went from trying to win the race to trying to win the championship. Dudes were just riding by you guys while you were trying to pick up your bikes and get unstuck! I didn’t care. It was me and Brownie. We were just looking around and trying to see where the other guy was. Taddy Blazusiak outlasted Mike Brown in a wild race at the season finale to claim the championship. Did you say David Knight fell on top of you and then helped you pick your bike up? Every other lap was it just nuts at that point? It was crazy. We were riding in slow motion. It was all about trying to just get around the track. Crazy. I want to watch that race, or maybe I don’t! You've ridden a lot better, is what you’re saying? Oh yeah. I don’t remember riding that bad ever. The pressure was there. Did you know for a while he was close? Mike was still right behind you, and Colton Haaker was right behind you guys, kind of following. Did you even know what was going on? Yeah, I knew Haaker was there and I knew that I was just going to take it easy. I had like a 10-second gap on Brownie when he went down in the waterhole. So I knew that Haaker was there and actually was trying to race me. I just went to the outside and let the guy go. It was all about winning the championship. It wasn’t about ending up 5th, 6th, 7th, or whatever. It was all about winning that championship. 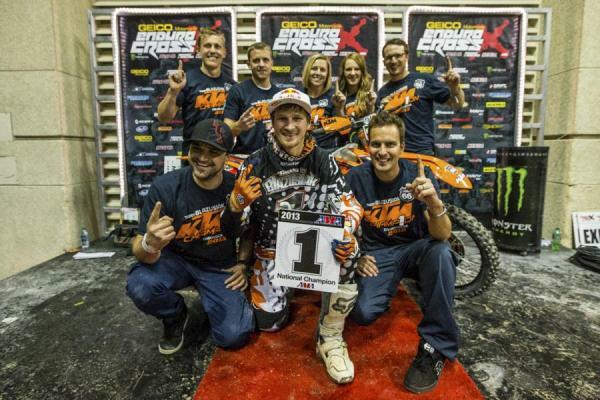 Blazusiak is now a five-time EnduroCross champion. So you knew eventually that you had a little lead? Yes. I still was going pretty slow, trying to make sure everything was going good. I had my mechanic with a pit board so I knew what was going on. Just trying to make it to the finish. You do not want this to be this close next year. It was the craziest race ever racing. And I’ve raced quite a few ones. And you still have a little more racing to do in other series in Europe, but is it going to be weird? You’ve got to have a sense of relief right now to get this thing behind you. Oh yeah, it was huge. EnduroCross is our main focus. It’s been a year of hard work and I’m telling you this championship was probably the hardest one to win. I wasn’t up to speed at first. I was coming off from surgery in my shoulder during the pre-season and everything. It’s been a crazy championship. At one point we were ten points down so to end up winning it, it’s crazy. We’ve done so much hard work, me and the team. So happy to win it. And they just keep coming because Cody Webb has won three of four now. So now he’s all fired up I’m sure for next year too. They just keep coming after you. You get to enjoy this one for now. It was a crazy season. I’m happy it’s done. I want to go home and celebrate a little bit.